I've been struggling to find the right coat for the current weather. Probably because I had such a clear out when we moved - I seem to be missing something not too heavy, but more substantial than a blazer. I also struggle with blazers generally - I feel like a bit of a knob in them at the school gate if I'm honest...like I'm wearing half of an old business suit I used to wear pre-kids...is that just me? 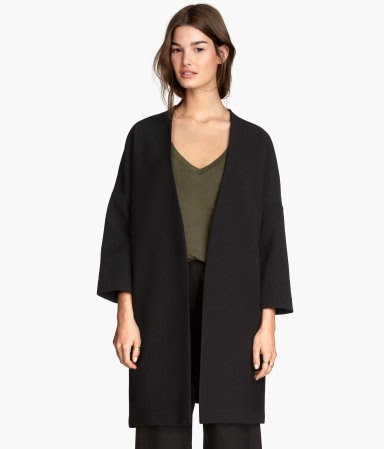 So what I've been looking for over the past couple of weeks is a loose fitting, black coat. Lightweight, not too much going on in the way of buttons/belts...I already have a couple of macs and I'm bored wearing them. Something a bit like this.. I couldn't believe it - exactly the shape and style I was looking for. It's going to work equally well with smart going out outfits and with jeans on the school run. All for £29.99. I'd just been in Primark so it was lovely to go into H&M and see some decent quality on-trend pieces. But honestly, there was very little else I could get excited about. 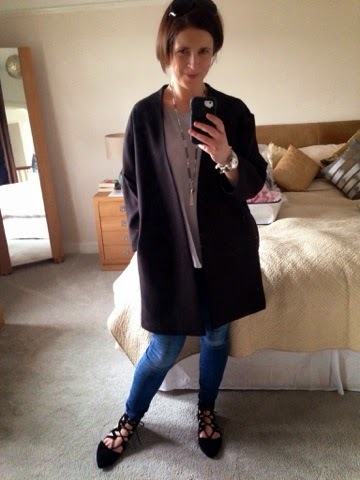 So here are some photos of me wearing the coat today..
Adore the coat, not sure about the shoes but at £10, I'll take a chance on them even if they bring back the Irish Dancing memories a bit too strongly. It's better than regretting it in a few weeks when they're all sold out. Hope you're having a good week so far...back soon with a sandals post! You're not the only one who feels like that wearing a blazer at the school gates - I just feel overdressed if I wear one these days. I wouldn't recognise myself from my former work days when I used to love a pair of heels and something a little more put together ... but hey, I get to dress how I like every day now so I really can't complain. And a good score on the shoes - I think they will help scratch the itch and sometimes we just need to do that don't we? Love the new look blog! Love the coat and shoes!!! Have you ever come across Primrose Boutique in Ballymena a new boutique opened recently with affordable fashion and accessories. Hi Avril - you seem to have popped up on my blogger feed again so I'm pleased as I forget to check you out otherwise. I was thinking of you last week as I was in Lisburn visiting sister and having my eyes tested in Brogan's where she works. Keep wondering if I'll bump into you. Or have you moved away form Lisburn now? Love the necklace and pleased the shop is open again. The silver overlapping leaves necklace I bought from is one of my favourite pieces of jewellery which everyone admires. My !5 year old often pinches it to wear too. I love the shoes... Keep lusting after the navy Boden ones! 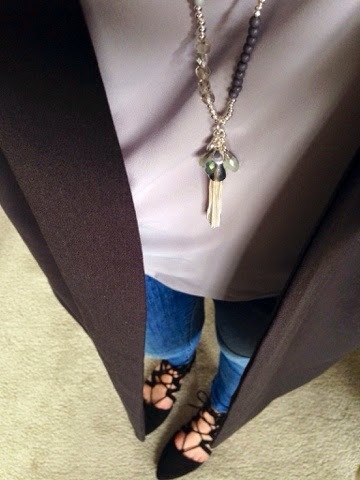 Love the coat, the shoes for a tenner you cant go wrong! The new layout of your blog is so much easier for me! Great coat! I completely share your thoughts on Primark - I took a wander in there recently (because back in Jan/Feb it wasn't too bad at all) and hurried out again coz it was all so vile. 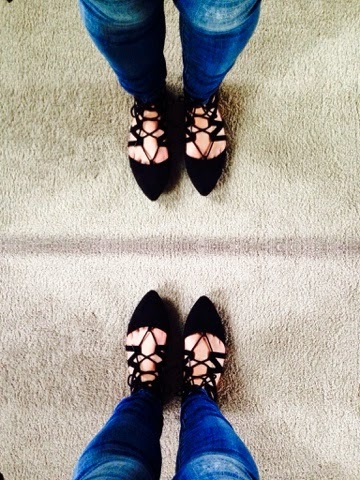 Also not at all convinced by the strappy shoes. Will be interested to hear what you think.